Nixon Motor Sports: Brian Takes 5th: Out of 103 Drivers! 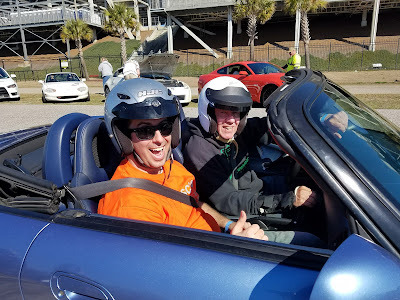 On a beautiful weekend in the Palmetto state, Brian Nixon kicked off the NMS season with a big bang on Sunday, taking 5th place overall PAX out of 103 drivers! This was a great turn-out at Darlington for the South Carolina Region of the Sports Car Club of America, and they'll be competing once a month for most of the rest of 2017. NMS co-driver last year Jason Rucker also landed in the top 10, with 10th place on the day in a different car. Brian and the NMS Miata competed in the Pro class, which features cars from all classes, and attracts the fastest drivers in the region. He placed a solid 4th place in Pro, and is off to a flying start in 2017.